We recommend you talk to your neighbours and to any local government community groups with your concept plans to assist them in understanding your proposal, consider their concerns and seek to compromise to achieve a satisfactory outcome. This may assist in reducing the number of submissions opposing your application. Agreement on what is required, as well as what is (or is not) possible on the proposed development site. 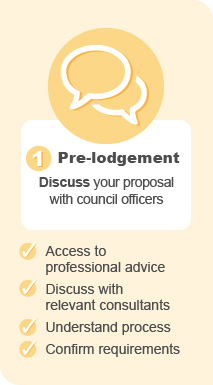 Click here to view Council's pre-lodgement advice services. The Supporting Documentation Guide (PDF 872KB) outlines the required documentation and information to assist you in preparing your DA. Providing the required plans and information on lodgement of your DA will assist us to assess your application within a timely manner. 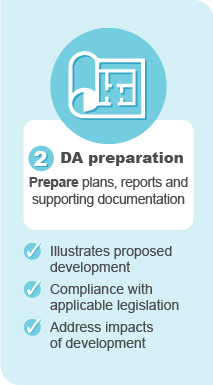 Below is a list of common development types and the supporting documentation required to be submitted with your DA. B: Beneficial - It will facilitate and speed up the assessment process. May be requested during assessment if not provided at lodgement. C: BASIX certificate is also required for residential alternation/additions with a value greater than $50,000 and pools with more than 40,000 litres. Other detailed information regarding lodgement requirements for certain types of developments may be identified within the Port Stephens Council Development Control Plan 2014. 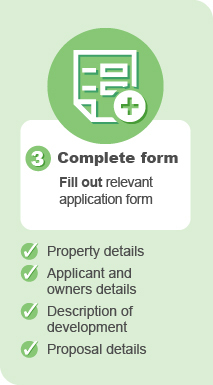 All of these forms are available for download from Council's A-Z forms page. Once you have compiled the documentation relevant to your development and completed the relevant form, you are ready to lodge your application. We have a statutory obligation to determine a DA within a certain timeframe. In order to meet these timelines, we need all the relevant information and therefore an incomplete application will not be accepted. Fees will be charged in accordance with our adopted Fees and Charges Schedule and are based on the estimated cost of works for the development. Using our new smart fee service you can obtain a quote (by fax, email, post or telephone) by contacting (02) 4988 0255 or emailing devbuild@portstephens.nsw.gov.au. All development applications and complying development applications should be accompanied by an electronic/digital copy of all supporting documents on a USB. Electronic information should not have security/protection and is to be formatted in PDF. Documents should be a separate file with appropriate titles to enable easy identification, e.g. 'Site plan – 1 Main Street, Raymond Terrace'. Internal floor layouts for residential dwellings need to be provided in a separate file due to privacy implications. If an electronic/ digital copy is not lodged, an additional fee of $50 will be charged to cover the cost of scanning documents. 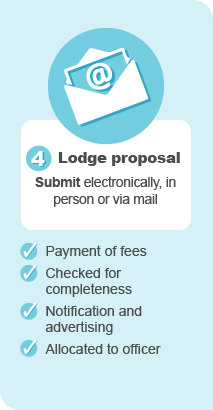 We encourage the lodgement of applications in electronic format for quicker assessment and to save fees. Your application will be allocated to a development assessment officer and be referred, as necessary, to other state government authorities and to internal specialist staff for their assessment and comments. Advertising in the local newspaper and notification of nearby neighbours will occur as nominated under the Port Stephens Council Development Control Plan 2014. An acknowledgment letter will be sent out to you advising who the assessing officer is for your application. This officer will be your point of contact in relation to the application. Submissions received by Council during the notification and/or exhibition period for proposed development applications, planning proposals, draft strategies and policies will be dealt with as per the internal process outlined below. The key consideration for staff undertaking the assessment of an application or proposal, or the preparation of a policy or strategy is the issues raised within the submission. Note: Where no contact information is provided on the submission, an acknowledgement letter or email will not be issued, and submitters will not be recorded in Council's record system, or notified of Council consideration of the matter, or subsequent decisions. Standard submissions - Standard submissions (including pro-forma letters) prepared by one or more people, or on behalf of a group are acknowledged directly to the person or group that sent the standard submission. Council counts the number of signatures on the standard submission and it is reported as one standard submission with 'X' number of signatures. Petitions - Petitions are acknowledged directly to each person that signed the covering letter accompanying the petition. Council counts the number of signatures on the petition and it is reported as one petition with 'X' number of signatures. The assessing officer will compile all information and comments received during the notification and referral process. If information is lacking, you will be sent a letter requesting additional information and the “Stop the Clock” will commence to allow the submission of additional information. 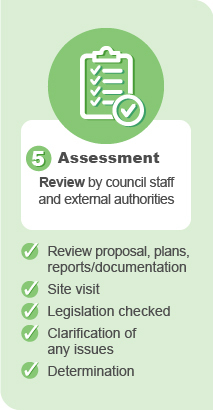 If all the relevant information is at hand, the assessing officer will carry out a site inspection, evaluate your proposal’s compliance with development controls, statutory requirements and any relevant objections. A development assessment report will then be completed and recommendation made. Council’s DA Tracker service allows you to follow the progress of your application online from lodgement to determination and view any relevant submissions in relation to the development. Note: During assessment, the applicant has the ability to advise they are not providing any further information and request Council make a determination. Determinations of DAs under delegated authority are in accordance with set procedures. The application may be determined by the Hunter and Central Coast Joint Regional Planning Panel (JRPP) if it meets certain regionally significant development criteria as identified under Schedule 7 of the State Environmental Planning Policy (State and Regional Development) 2011. In this circumstance, Council officers will carry out the assessment of the proposal to be presented to the panel for determination at a public panel meeting. Following determination of the application, we will write to the applicant and provide a notice of determination (NOD) listing the conditions of consent, or reasons for refusal. A copy of the stamped plans and other relevant documentation will also be provided to the applicant. In accordance with Schedule 1, clause 20(2) of the Environmental Planning and Assessment Act 1979, the NOD will outline the reasons for the determination and consideration of community views. Where notification was required, we will notify all persons who made a submission in relation to the application of the determination of that application. If consent is granted for your development, a schedule of conditions will be issued with the notice of determination. The development consent is structured to assist in the project management of the development and these conditions must be complied with. The conditions should be read in conjunction with the stamped approved plans. Please note this is an overview of general requirements and there may be other applications, certificates, registrations or notices that are not listed below. To modify a consent, you must complete the relevant application form to be lodged along with the relevant plans and supporting information. If the proposed modification does not fall into one of the above categories, you may need to lodge a new development application. Depending on the nature of the modification, different supporting documents will need to be supplied. Original supporting documentation that will be affected must be amended and provided with the modification application. Before undertaking any building or construction work, you will need to obtain a construction certificate (CC). A CC application may be lodged at the same time as a development application or at a later date. The CC can be lodged and issued concurrently with the DA, or once consent for the DA has been granted and any relevant conditions have been met. A CC certifies that the detailed construction plans and development specifications are consistent with the development consent and also comply with the Building Code of Australia. 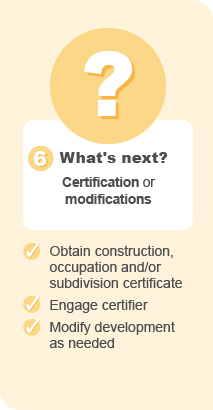 Civil works associated with subdivisions may also require construction certificate approval. You can obtain the certificate from either Council or an accredited private certifier. Port Stephens Council currently obtain a market share of over 80 per cent of certification works within the Local Government Area. We encourage you to contact Council’s certification team on (02) 4980 0115 to obtain information relating to Council’s competitive certification services and relevant fees. It should be acknowledged that all relevant fees (including the Long Service Levy if applicable) must be paid prior to issue of a construction certificate. Your application may require approval for one or more of the matters listed under Section 68 of the Local Government Act 1993 (LGA) such as installing a manufactured home or mobile dwelling, installing or altering a waste treatment device, operating a car park, caravan park or manufactured home estate, or conducting activities on community/public land. If Section 68 activities are to be undertaken independently from a DA, a separate application form must be submitted to Council for approval. If the Section 68 works are to be carried out as part of a DA, a separate application form is not required. The appropriate box must however be ticked on the DA form and relevant fees paid. Please call Council's Environmental Health Team on 4980 0161 for further information. Your application may require approval under Section 138 of the Roads Act 1993 for works within the public road reserve including (but not limited to) road pavement works, kerb and gutter, footway works, vehicular access crossings and drainage works within the road reserve. A separate application form must be submitted to Council for approval for these works. Please contact Council's Engineering Section on (02) 4980 0409 for further information. Following the issue of a development application (DA) consent for a subdivision, a subdivision certificate approval will be required to authorise the registration of the plan of subdivision for lodgement with NSW Land and Property Information Services (LPI). A plan is to be prepared by a registered surveyor and lodged with Council with a subdivision certificate application form, relevant fee and supporting documentation. Supporting documentation requirements are nominated on the form. A subdivision certificate, as provided for under Section 109C(1)(d) of the Environmental Planning and Assessment Act 1979, certifies that the subdivision has been completed in accordance with the consent and any subdivision work has been completed in accordance with the CC (which may include civil construction works such as rights-of-carriageway, roads, footpaths, water and sewerage asset construction). An occupation certificate authorises the occupation and use of a new building or a change in use of an existing building. Such buildings or a nominated part of the building must be suitable and safe to be occupied, in accordance with the relevant requirements of the Building Code of Australia (BCA). Please refer to the building certification page or call Council's Building Surveyors on 4980 0115 for further information. The review must be completed within six (6) months of the determination of the application. Therefore it is advisable to lodge the application for review as soon as possible to allow Council adequate time to reassess the application and conduct any required notification or advertising processes. A review of a modification determination (Section 4.57 of the EP&A Act 1979) application must be lodged within 28 days from the date of the original decision. Please note that the request for a review under Section 8.2 means that the whole determination is open for review and if you are only concerned with one condition it may be more appropriate to lodge a modification application (Section 4.55). A review can also be undertaken at an applicant’s request under Section 8.2, Section 8.3 and Section 8.4 of the Environmental Planning and Assessment Act 1979 where Council does not accept a development application (i.e. it is rejected and not determined). The application will be reconsidered by a person with a higher level of delegation than the original determination. A statement of support must be submitted with the application, stating the reasons why Council should review its decision. If you are dissatisfied with Council’s determination of a development application or Council has not determined the development application within the statutory timeframe, you can lodge an appeal to the Land and Environment Court to determine the application. An applicant has six months from the date of determination to lodge an appeal to the Land and Environment Court. Further information can be obtained from the NSW Land and Environment Court website.